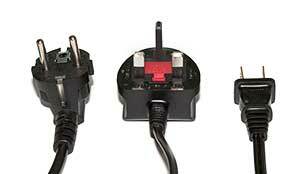 From left to right we have a European two pin round plug, a UK style three pin rectangular, and on the right a US/Canada style two pin flat plug. So, where do you buy them? Most international airports have them - you'd be wise to buy them in your own country before you leave though. Often they're sold in electrical stores too, and in the UK at least in many other locations too (larger supermarkets, larger Post Offices etc), although you may only find adapters to connect local plugs to foreign sockets. The first step in choosing a mobile phone, is to find out what networks the countries you're intending to visit have! Generally countries either run GSM 900/GSM 1800 or they run GSM 1900 / CDMA. If a country uses the US mains voltage it tends to use the US preferred (GSM1900/CDMA) mobile phone systems as well. Note: If you're roaming, and you still aren't getting a signal, despite having roaming enabled and being in an area that should have coverage it's possible that you need to change band, my old Motorola T250 had two modes "GSM1900" and "GSM900/GSM1800", and you needed to switch between the two manually! Once you've decided which networks are the most suitable you need to choose a handset (i.e. the phone itself)! If you're going to do a lot of international travel, then you should consider getting a quad-band GSM handset - remember what I said about the roaming costs though! If you're planning on making (or receiving) any significant number of calls abroad, then consider picking up a pre-pay type SIM card in that country. If you're going to use a new SIM card, you need to make sure that your phone isn't SIMlocked - basically a SIMlocked handset will only work with a SIM card from the same network it was sold with so check whether it's unlocked when you buy the phone! That said you can usually buy the unlock code from your service provider, and sometimes independent shops will unlock them for a modest fee. Handsets can often support a variety of networks, which type(s) usually depends on the region it was purchased in! For example most handsets in the UK support GSM900 and GSM1800 - since those are the network types that are used in the UK... Handsets in the USA may support different standards, like CDMA - it's vital that you match a handset/provider to the area you're planning to visit! There are also key values to choose which handset is best for you - when travelling weight is important, but don't forget to find out how much the charger weighs as well, and whether it supports the electricity supply in your destination! Check the Standby and Talk times - the higher these figures the better generally. A higher talk time enables you to talk on the 'phone for longer without recharging. The Standby time is how long the handset can wait for a call without making or receiving a call on one charge. A good modern handset can run for an entire week on one charge if there are no calls! Note: SAR values are calculated differently between countries, so make sure you're comparing similar results. GSM = Global System for Mobile communications, currently the best network type for travelling. SIM = Subscriber Identity Module, effectively the "brains" of the phone - contains the telephone number, and usually stores your SMS messages and speed dial numbers. SMS = Short Messaging Service, allows you to send and receive short text messages - usually up to 160 characters. 3G = Third generation network, the main difference with 3G is that the data transfer speeds are higher. Memory card prices are falling every day, so if you're just going away for a week or two, and plan to shoot JPEG, then you're probably better off buying enough memory cards for your trip. However if you're going to be taking large numbers of images (particularly RAW images), or you're going to be away for a long time, buying enough cards to store all your images is likely to become very expensive. Fortunately there are a number of solutions to this problem. Which solution works best depends on how long you're travelling and how many pictures you need to store. What about email/ftp/web? You may be wondering why I haven't included email/ftp or photo sharing sites as a solution to use whilst travelling - the reason is simple, if you're going to upload any significant amount of data then it's going to take a long time, time that might be better spent talking to other people or exploring your location... So, just how long will it take? Well, that depends on how you're connected - if you're in a quiet internet café with a broadband connection things might be reasonably quick - say an hour for a 256Mb card assuming your storage location is relatively local and fast, however it's rare that you'll have a connection to yourself, and outside major cities broadband is not common in some parts of the world. So what might be realistic? In rural areas the best you're likely to find is a 56k dialup (which offers a maximum upload speed of 33.6kbps) so under ideal conditions that 256Mb is going to take nearly eighteen hours!! In reality you'll be sharing that connection with others, and the maximum connection speed may not be possible - so you could be looking at far longer. I bet that standalone portable hard disk is starting to look attractive now! Burning CDs in an Internet café or photography store. It's increasingly easy to find such facilities in more popular tourist areas since many people are travelling with digital cameras these days, but in more remote areas you still might not find anything easily. If you're planning to take lots of photographs or visiting remote areas then burning as you go probably isn't the best choice for you, since you'll spend a lot of time trying to find places to burn CDs (or you might not find anywhere at all in less visited places) - consider the length of time it's going to take you to find somewhere to do it - and whether that time would be better used travelling. Remember to check that the CD is readable on a different computer before you re-format the card - and keep those CD's safe so they don't get broken! Also be careful, it's possible that your discs will be infected with viruses if you're unlucky. I'd strongly recommend burning two copies, one to send home and one to carry with you - CDs can easily be broken, and the international postal system can be unreliable... Generally photography stores will require you to leave the card with them and they'll create the CD for you, since this is a service it generally costs more than burning to a CD in an internet café which is generally a do-it-yourself experience. If you're leaving your card make sure you know how long it's going to take first! So, what is a standalone portable hard disk? A standalone portable hard disk, or portable storage device (psd) is a gadget that contains a laptop hard disk, a battery, and an interface for your memory cards. The advantages of standalone portable hard disks are that they're much cheaper than buying cards (at the time of editing (13Jun2007) 100Gb of CF cards would cost 937USD, an 100Gb standalone unit 179USD - 5x cheaper! Although the difference is falling all the time). Most standalone PHD's are relatively small - often smaller than the LP Thailand book for example, and quite easy to use (insert card and press copy) - the big disadvantage is all your images are in one place, so if the device gets stolen or broken then so do all your images. Note: Do not confuse this with an external hard disk, often also referred to as a portable hard disk which generally won't have a battery and will require a computer to transfer the images. Epson P5000 epson.co.uk P5000 review @ prophoto.typepad.com Fast, good colour screen. Canon announced their own portable storage solution, the M30/M80 - as yet there are no reviews online. From the specifications it looks like it should be of interest to Canon dSLR users though. There are an increasing number of hard disk based MP3 players that can store images directly - either through their own card slots, or by connecting directly to some cameras using USB-on-the-go. Less useful options IMO are the Apple iPod range - whilst being good MP3 players they can only be used to store pictures with an optional adapter - which is very slow compared the standalone storage options. Note: The iRiver H3xx supports USB-on-the-go only on non-US models, the US model lacks that functionality.... For more information about MP3 players have a look at the MP3 players section of this FAQ on my Buyers Guide page. Remember to treat your PHD with care, afterall it contains all your images! Consider making a backup, but be careful - write protect the PHD (if possible) before connecting it to an unknown machine, and check that the machine you use is virus free - afterall you don't want to risk losing your precious pictures! Personally I travel with a pair of PHD's, a NextoCF Ultra ND2525, and a CompactDrive PD70X - it gives me redundancy, without making things particularly heavy. Don't leave them both together though, carry them in different bags, and make sure that one is on you at all times. Theft is the most likely cause of image losses, but storing them in ziploc style bags when not in use seems like a good precaution. Note about CDs/DVDs: Make sure you use good quality archival media like these CDs and DVDs if you want the discs to be readable in the future - I have unbranded media that I can't read any longer that are only five years old, yet good branded discs recorded at the same time, and stored/used almost identically are fine... Note: I haven't performed any longevity testing on these, the recommendation is based on the manufacturers specification. Consider burning two copies whilst you're travelling, so you can send one home and carry the other copy - that way if one gets lost in the post or broken you'll still have a backup. For best long-term results store discs between 5ºC and 30ºC (ideally around 5ºC), and keep the non-condensing humidity <50% (ideally 8% or so) - keeping the discs in their jewel cases prevents them from rubbing/sticking to surfaces, and store them vertically. Also be careful about labelling - ideally you shouldn't apply labels to the discs themselves, and writing on them can cause premature deterioration. Label the cases instead if you can. Also read the manufacturers instructions! Note that the standard, frequency band, and variant will all need to be correct before you'll see anything! If you want to use broadcast stereo sound things get even more complicated, since there are four different standards in use (broadly: German, British, US, and Japanese). DVD players are region encoded, this means that a disc bought in one region probably will not work in a player from another region. Some players are sold region-free, which means they've been modified to play discs from all regions - this sometimes means that they can't play certain discs that an unmodified player can. In addition to the region being an issue, you also need to check that your player (and TV) can display the format of the DVD - usually PAL or NTSC as mentioned in the TV section above. DVD regions are roughly based on geographical boundaries, and are usually referred to by their number (from 0-10, with 0 being "all regions") - look for a picture of a globe with a number superimposed on it, that's the region the player/disc will work in (player and disc should be the same). Warning: This section is about game disc/cartridge compatibility, not games console hardware compatibility. 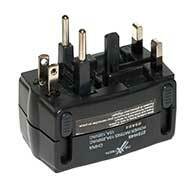 With consoles remember that voltage and video standard requirements may change from country to country too. Sony PS2: There are four game regions - Japan/Asia: NTSC/J, North America: NTSC-U/C, Europe/Oceania: PAL, and China: NTSC/C. Sony PSP: UMD video is region coded as per DVD, games can be region coded but usually aren't in practice - however Sony recommends that for multiplayer games all discs should be from the same country. For pre-recorded video tapes you need to check that the tape you're buying is compatible with the player that you intend to use - tapes are either recorded as PAL, NTSC or SECAM. Many European VCRs can play back NTSC tapes, but few American ones can replay PAL/SECAM ones, remember you'll also need a TV that can display the signal - check before you leave, you don't want to come back and find you can't watch them! Most tourist videos are offered in the three major standards, if in doubt ask. For cassettes the sub-variant is not important, since the information is recorded onto them identically regardless of whether they're PAL-I or PAL-B. As with TV sets, you need to match the VCR exactly to the broadcast standards and versions of the country you're in. A PAL-I compatible VCR is unlikely to record any sound from a PAL-B/G transmission (and might not be able to see the PAL-B signal at all). However, you can use different PAL versions to communicate between devices if you connect via composite/s-video/RGB - so you could use a PAL-I VCR as a tuner for a PAL-B/G TV. As a generally rule of thumb if you just need compatibility using video type interconnects (e.g composite/s-video/RGB) all you need to do is match the general standard for the connection to work - PAL vs NTSC vs SECAM, if you use RF (aerial cables) or need to use the tuner then you need to check the variant as well (PAL-I vs PAL-B etc). Due to current heightened security measures most airports have a list of things you are not allowed to have as carry-on luggage, they should be explained to you at check-in. I would always carry anything valuable/sensitive as carry-on wherever possible, as things can get damaged or disappear when you can't see what's happening! Whilst travelling many people need to call another country. If you just pick up the hotel phone and dial you could be in for a very nasty surprise when you check-out! So, what's the solution? International calling cards. An international calling card is a card that allows you to use another telecoms provider to call through to the country of your choice - usually they offer a toll-free (freephone) number to connect, and international direct dialling for a fraction of the local phone companies rates. Note: An international calling card is not the same as a phonecard - phonecards are inserted into specifically designed telephones, international calling cards generally do not! So, how much can you save on a long call? Lots... I tend to call Canada frequently, and BT (my local telco) charges 21.26GBP for a 90min call made during the day - by comparison using my preferred calling card the total cost of the call is 2.38GBP - that's nearly 10x cheaper! So, where can you buy these things? They're generally most widely available in areas where tourists are common, or there's a large immigrant population. They're most often sold in smaller independant grocery stores, or independant newsagents/tabacconists and convenience stores. I've purchased cards in Canada, USA (inc Hawaii), UK, Australia, New Zealand and Singapore - the only country I couldn't find any cards in was New Caledonia. Are those the current rates? Is the rate for local call access, or toll-free access? Is there a daily use fee? How many days after the first use will the card expire? Is there a payphone/mobile surcharge? Do the rates apply to the whole country (both the one you're calling, and the one that you're in), or just this areacode? Warning: If you're planning to call from a hotel telephone find out if toll-free calls are actually free, and make sure they don't charge by the minute! It is also possible to make calls via a PC for free if you both have a good internet connection and a headset/microphone at each end using products like Google Talk or Windows Live Messenger. Whilst you're overseas you'll probably end up paying internet cafe fees though, and these can be higher than the calling card rates! As with almost anything involving electicity, unfortunately even the humble radio is subject to different standards around the world! Analogue (dial type) radios should work in most countries (unless you're using FM in Japan), but digitally tuned radios (number display types) probably won't work unless they have user adjustable frequency steps. There are some digitally tuned radios with options to allow them to work in both areas (like the Sangean ATS-909 for example) - but it's probably simpler and cheaper just to go with an analogue tuned one. DRM is starting to pick up, but it's still a long way behind DAB in acceptance. Open the HOSTS file in Notepad and check for any entries that include your bank - there shouldn't be any, so if you find them it's likely the computer has been compromised. Next go to the Tools menu and select Internet Options - go to the Content tab then click AutoComplete, in the section "Use AutoComplete for" clear all the checkboxes - particularly the "User names and passwords on forms" box. You do NOT want the next person to accidentally get into your account! If you can't change the settings assume the worst and do NOT use the machine. Is there some reputable anti-virus software installed? Is it active, and is it up to date? If not consider going somewhere else. If you're feeling paranoid about a keyboard logger then you can always create a document with all the letters of the alphabet in it, and then copy'n'paste the letters of your password into the password box individually - be aware that this could make things easier if they're watching your screen usage though. Visit the bank online, it's safer if you type the URL directly - don't click on any pre-made links since they could redirect you to a clone of the bank's website - if anything doesn't look right at this point walk away... When you login look for an option to "keep me logged in on this machine" - make sure it is set to not do so! Even after all these checks it's still possible that all the communications between you and the bank are being carried out through a proxy that's logging your every move or that you missed something. Scared yet? Perform your transactions, then clear the history of the machine - go to the Tools menu, then select Clear History. Then select Delete Files under Temporary Internet Files - check the "Delete all offline" box, and then click OK. This should delete any local copies of the pages from the machine you're using. Finally type the login URL again and see if it automatically logs you in - if it doesn't then you're probably OK, but there's no guarantee unfortunately.